This custom built home in Dexter has tons of upgrades and is in move-in condition! 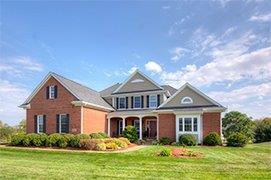 The covered front porch welcomes you into a gorgeous foyer and great room with soaring 18 foot ceilings. Gleaming hardwood flooring and a stunning gas fireplace set the mood for this wonderful gathering place. 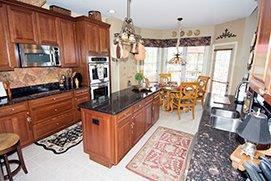 The kitchen is adjacent with a pass-through breakfast bar, center island and bayed breakfast nook. The custom hickory cabinetry, granite counter tops and stainless steel appliances will make you feel like a top chef! The deck just outside the breakfast nook will be a perfect place to entertain. A lower level patio is also available for added room! A formal dining room off the foyer includes hardwood flooring, tray ceiling with custom details and crown molding. Also included on the first floor is a study, with private bathroom that could be a guest room or home office. This home features four bedrooms including a first floor master suite. The tray ceiling and walk-in closet are just the beginning of this gorgeous room. A beautiful bank of windows looks out to the yard, and it is all tastefully decorated with wood blinds and fresh carpeting. Crown molding finishes off the space. The master bath features dual sinks, plenty of wood cabinetry, granite countertops, a large jetted soaking tub and separate shower. The remaining three bedrooms all feature walk-in closets and share two additional full bathrooms. The fourth bedroom is very large, could be used for an au pair, media room or craft space. The finished walk-out lower level is fantastic. A beautiful place to entertain friends and family. Featuring a bar, TV room, full bath and exercise room. Plenty of storage in the lower level also. A three car attached garage will be perfect for vehicles, toys and storage! This home is on 2.15 acres, in a private country subdivision, just minutes from the City of Dexter and 20 minutes to Ann Arbor! This is the perfect home in the Dexter real estate market!